In celebration of Family Literacy Day, the Canadian Children’s Book Centre has compiled a list of 36 Canadian books (12 picture books, 12 works of junior/intermediate fiction and 12 works of young adult fiction) that share in the joys (and struggles) of families of all sizes and combinations. 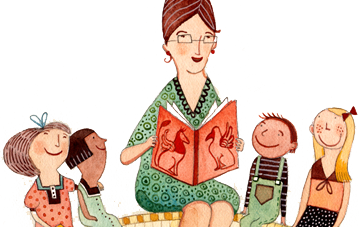 Why not celebrate this year’s Family Literacy Day with one of these fine books. Reading levels (RL) are listed by grade; interest levels (IL) are listed by age. When Anna May is young, her grandmother makes her a beautiful blue cloak and when she wears it, she feels like a queen. Soon Anna May grows out of the cloak — but she never forgets her favourite piece of clothing. Determined to pass on the love in the cloak to all those in her family, Anna May creates cherished memories for her daughter, grandson and great grandson. A little girl invites her mom to spend the day in kindergarten and discovers that Mom doesn’t even know the basics about being at school. She barges into line, forgets to take her outdoor shoes off and talks all through story time. This is a great book for children who are about to start school. Pumpkin is big and smart and dependable. Tweezle is small and cute and loveable. Sometimes middle monster Hoogie feels like the hole in the middle of a donut! Luckily Mom and Dad are there to remind her that the middle can be a very special place. This evocative story about two brothers who are growing up and apart, it seems, occurs in a special tree house that proves childhood is not just a time but also a place. Alone in the tree house during a blackout, the younger brother crowns himself king of the castle, but finds his enchantment with his favourite place has waned without his big brother to keep him company. A beautifully illustrated and poetic board book for babies and toddlers that celebrates every child and the joy babies bring into the world. In this lyrical and beautifully illustrated story, a young girl shares a special celebration of the Chinese Moon Festival with her parents. Mama and Baba tell her ancient tales about Chang-E, the woman who lives on the moon in the Jade Palace; Wu-Gang, the lazy woodcutter; and Jade Rabbit, who brings food to those on earth who need it. This advanced picture book, which explores First Nations culture, tells the story of how Nala and Qiatsuk became sisters through Inuit custom adoption. Based on the author’s own family, the story explains the unique process of custom adoption and introduces kids to the importance of adoption within Inuit culture. Adorable illustrations and heartfelt text bring this tale of family love to life for all readers. Our hero must face one more hurdle in accepting his nana’s new “family.” Nana’s new husband, Bob, has a granddaughter named Hortense. They were friends last summer — but over the winter she’s changed and the tentative friendship they shared seems a thing of the past. Will planning Nana’s birthday party help them find some common ground? In this warm, funny book, an adorable penguin learns that Mom or Dad “will never let you go.” Safely assured by the steadfast love of a parent, the little penguin can begin to explore its world, secure in the knowledge that a doting parent is always waiting in the wings. Every Sunday Aunt Essy, Aunt Chanah and Uncle Sam visit for the afternoon and no matter what anyone says their response is always the same — “Oy,” “Feh,” “So?” But this time the kids turn their visit on its head and soon they are all laughing so hard they’re practically crying. Charlie’s grandpa used to entertain him with fantastic stories, but lately Grandpa’s just not himself. A disease has stolen his memories, his appetite and even his smile. What can Charlie do to help bring Grandpa’s smile back? With tenderness, sensitivity and humour, this story explores the effect that dementia has on a young boy and his family. This title is also available in French as Vrai de vrai, papi? A beautiful book that every baby and new parent needs to be introduced to. Barbara Reid’s wonderful, colourful, tactile illustrations, showing babies and their families together, will enthrall adults and children alike! In this sequel to The Whole Truth, Kit Pearson sends her endearing heroine, Polly, off to boarding school. The adjustment is difficult, but at least her family is intact again and there are no more secrets to keep hidden… that is, until her sister Maud makes a dramatic confession. Will Polly be able to keep Maud’s secret, or will she tell her father before it’s too late? This early chapter book contains four short stories about Annie, her big brother, Sam, and their dog Hazel as they visit a lake to watch and draw the wildlife, deal with Simon’s sneeze, muse about the nature of dogs and cats and collect horse chestnuts that mysteriously go missing. The Evans twins are complete opposites: Owen loves basketball, Russell leads the academics team. When Russell starts playing basketball, Owen struggles to define his place within the team and the family. Once the dust settles, the boys know they’re ready to face the future as brothers and friends. Brovko, a big shaggy sheep dog, has a good life with his master Andrei and his family. But when Andrei’s family decides to move to Canada, they cannot take Brovko with them. The dog tries to get along with his new family, but his heart just isn’t in it. It soon becomes clear that Brovko has to find a way to get to Canada and be reunited with Andrei. This is the prequel to Andrei and the Snow Walker. Feeling abandoned by Mattie, Benji and Michael, Clarissa is looking ahead to a rather boring summer. But then her mom gets engaged, and Clarissa’s long-lost father shows up in town. Determined to meet him, she decides to track him down. But will she be happy with what she discovers? This is the follow-up to Words That Start with B and Love is a Four-Letter Word. Patrick thinks his family is just fine. His mother died when he was too young to remember her, but he, his brother Trevor, and his father have a great life together. That is until his father introduces Linda to the boys. Jeremy’s life changes forever during the summer when he discovers that his father has cancer. But then he finds an unlikely friend in Tess, who knows what it’s like to lose someone. And as their friendship grows, Jeremy discovers that his father has given him something that will live forever. This Canadian classic includes an introduction by Kelley Armstrong. Artist, animal lover and would-be swimming sensation Mimi Power knows what it’s like to live under the tyranny of a three-year-old sister. Finding creative space in all the chaos is getting harder and harder for Mimi. But with the school art show looming, Mimi comes up with a plan that should be three-year-old foolproof. But to know for sure, Mimi will have to find her own little piece of the sky. In 1963, the year of President Kennedy’s assassination, Jack and his family are reeling from the death of his baby sister. Jack decides to set a world record to help his parents heal, but world events overshadow every record Jack tries to beat, from sausage eating to face slapping. When a friend suggests a different approach, Jack discovers the healing properties of music. It is 1967, and 12-year-old Ruth Iverson’s world pretty much revolves around her friends, a boy she likes, the Monkees and spending time with her dad, doing special stuff like watching the Toronto Maple Leafs win the Stanley Cup. But she is soon to realize that her mom’s strange behaviour, which has become an embarrassment, is a symptom of a disease that will affect the family’s life, and possibly Ruth’s future. Nick Macklin was a talented hockey player and an A student and he had the greatest dad in the world. His dad was not only there for him after his mom died, he was also a star player for the Vancouver Canucks. But when Nick’s father is convicted of murder and given a life sentence for a crime he says he didn’t commit, the only thing that keeps Nick going is the burning desire to seek justice for his dad. Abby’s skiing plans for spring break are ruined when her parents have to leave the country for an emergency medical mission. She must stay home and look after her increasingly confused grandmother. When Abby runs into Kyle, an aloof classmate of hers, she begins to think spring break might not be so bad after all. But despite the love between Abby and her Nonna, one terrifying and desperate night changes their lives forever. After her mother dies, 14-year-old Zoe is whisked away to Newfoundland to live with a father she has never met. In the tiny village of Port au Choix, she gets caught up in the search for the habitation site of an ancient culture that lived in the area more than four thousand years ago. At the same time, Zoe goes through her mother’s journals, discovering secrets that baffle and confuse her. This Canadian classic tells the story of Michael’s struggle to survive in his new world. After his parents are killed in a car crash, Michael is sent to live with relatives in St. Albert, Newfoundland. In vivid, honest prose, it depicts his fight against those who threaten him — the loud-mouthed Kentson who makes fun of the way he talks at school, and his uncle who tries to rule life at home with an iron hand. It is also the story of the friendship that develops between Michael and Curtis, his cousin, and of his new uncertain feelings for Brenda. Hallie and Grace Weston have never really seen eye to eye. So when their father dies and leaves everything to his new wife, the girls are forced to pack up and leave San Francisco for a relative’s house in Beverly Hills. Naturally, the two sisters take to their changing lot in typically different styles. Blake Russell always looked out for his younger brother, Blair, until they reached high school and began playing football. Blake, a senior and a quarterback, moved in different circles with friends who partied, bullied younger players and abused the girls they dated. As the differences between the two brothers become more pronounced, a body is discovered in a field north of town, severing the brotherly bond and dividing the Russell family forever. Quiet, out of shape, and bold only around his neighbourhood’s neglected dog, Nix is the polar opposite of his vibrant sister, Roxy. But he’d do anything for her, even hide her late-night partying from their parents. When Roxy goes too far, Nix feels like it’s his life that’s spiralling out of control. Nate Huffman’s plans for the summer change drastically when his estranged father reappears. Nate’s dad wants to take him on a road trip through the jungle of the A Shau Valley in Vietnam where he experienced a battle that changed him forever. As Nate’s father relives the horror of the war, Nate undergoes some changes of his own, and both father and son experience something unexpected. When all of Ethan’s hard-earned cash goes into paying for car repairs, he thinks he’s found a way to make some easy money. His downward spiral into the world of online gambling intensifies when he learns the secret his dad has been hiding. A shocking act of violence serves as a wake-up call for both father and son and offers a final chance to heal the growing rift between them. Tired of being shuttled from one foster home to another, Kyle McGinley has stopped talking because no one listens. At the home of Scott and Jill Wardman, however, Kyle thinks that maybe life could be better. With the help of a crow, a swamp and an excess of black paint, Kyle faces the most difficult task of his life — making friends with himself. Sid has lived with his foster parents since he was two and has seen many kids come and go. When a stranger shows up asking for his help, Sid is not sure what to do. He is ill-prepared for the surprises he finds when he leaves his foster family on their remote island home in search of the mother he doesn’t remember and a brother he’s never met. When Adam meets Robyn at a support group for kids coping with obsessive-compulsive disorder, he is drawn to her almost before he can take a breath. But when you’re 15 and the everyday problems of dealing with divorced parents and step-siblings are supplemented by the challenges of OCD, it’s hard to imagine yourself falling in love.